Ghost Pictures: Who or WHAT Was Looking Back at Me? Is this a ghost looking back at me? When I was six years old we lived in a rundown house in the country not far from a cemetery. I was scared to death of the cemetery. Why, I don't know, but I'm not now. My mother passed away in May, 2009 and was buried in that cemetery. I even bought a plot there for myself to be buried in someday. About three weeks ago I went to visit my Mom's grave. On the way back, I figured I'd stop at the old home I had once lived in as a child. It was boarded up except for a couple of windows. I had not been there since I was 6 years old! I took several photographs and got some weird shots. None as weird as the one I am sending!! This one was taken, outside looking in, of my brother's and my bedroom. I had seen nothing looking in but the picture shows something was definitely looking at me!! The sun was going down on the opposite side of the house so it did not play any part in the picture and what was captured. What interests me even more than the photo is the fact that the location says Bryan, TX. I live here in Bryan. 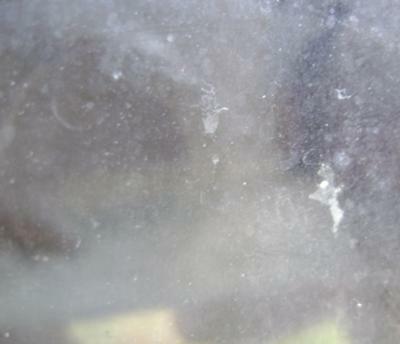 It looks like someone's face very close to the inside of the dirty window glass. The face is wearing large round framed lightly tinted sunglasses. I can see the second eye I am sorry but I believe that is the most wierd thing ever. I cant look at that picture again it freaked me out! Wow!! I saw the face right away. You can even see the outline of the left eye. Pretty strange!!! Def. A face doesn't look human though. All I see is a LOT of dust and what some idiot will call "Orbs"... I think you may have uploaded the wrong picture? Ghostly image appears in the snow..